Note: the following post does not mention Charlie Sheen. If you’re looking for the latest, check the following sites: http://www.livinginadreamworld.com, http://www.mindlessvacuousentertainment.com, and http://www.foxnews.com. Watching the latest budget negotiations (if that’s what you call the posturing, rhetoric, and sound bites) is like watching a Boy Scout hacking at a redwood with a penknife. All this rigmarole over domestic discretionary spending, i.e. 17.8% of total spending (which I figured from Congressional Budget Office (CBO) figures). Cut it all and we’d still have a deficit over something like $800 billion, hundreds of thousands of jobs would be lost, and the impact would be felt most by those who are least capable of dealing with it. 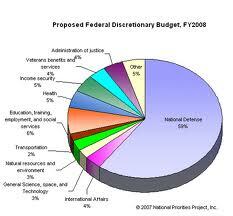 Defense spending: This adds up to slightly more than domestic discretionary spending (CBO). We can’t continue to spend more than the next 16 countries combined on defense in the misguided belief that it makes us safer. The 9-11 attacks cost $500K. A terrorist can make ricin in a bathtub. Intelligence and good old fashioned police work (not to mention a rethink of our role in the world) will make us safer. Not $800 million fighter jets. Entitlements: We know what we need to do about Social Security (no, not privatization: the U.K. and Chile experiments demonstrated what a disaster that would be, and how much it would cost future taxpayers). The health care bill, flawed though it is, at least attempts to start a dialogue about the unsustainability of the costs for companies and government, and saves some money over the long-term. But until we understand that much of our health care spending is wasted, our system is grossly inefficient, and people need to take responsibility for their own health, we’re not going to get anywhere. Revenues: Without serious tax code reform, and a willingness to raise taxes (or change the tax structure) for those who can afford it, the deficit fighting effort will go nowhere. Right now (and in spite of how many people believe we’re overtaxed), government revenues are at their lowest levels of GDP (14.9%) in the 40 years the Congressional Budget Office has been keeping records. For 2009 (last year isn’t available yet), federal, state and local income taxes consumed 9.2% of personal income, the lowest level since Harry Truman was president.